They have spent half their lives outside of India in America. When Swadesh Chatterjee came to America from the small town of Somamukhi in West Bengal, he carried just $35 with him and degrees in engineering and physics. In true American style, he created a multimillion-dollar company. Then, in his 50s, he sold it to dedicate his time to educating American policymakers about India and was awarded a Padma Bhushan from the Indian Government for his efforts. At 50, Sital Jain of Westchester, N.Y., gave up a successful full-time career in the construction business to take off on unknown trails to the North Pole and the South Pole, even to the rarely traveled ice-bound Antarctic, which can only be accessed by nuclear powered Soviet breaker ships. Adventure is his new mantra and he is now headed to the Gobi Desert in Mongolia and to Siberia. In her 40’s, Anju Bhargava of Livingston, NJ, sidetracked from her career in corporate America to explore the possibilities and pleasures of community building. This led her to interfaith dialogues and a completely new avocation as the first female Hindu pujari officiating at marriages and prayer ceremonies and teaching audiences about Sanathana Dharma through PowerPoint presentations. This generation of Indian immigrants now in their late 40s and 50s is the first in substantial numbers to have spent at least half their lives outside their homeland and thus experienced two worlds on parallel tracks. This is the generation that came to the United States in the 1980s and 1990s mostly as students or young brides to start a new life in the New World. All these years it was about getting degrees, establishing careers and a family, and then seeing the children leave the nest to start careers and lives of their own. Now this group of 250,000 Indians has arrived at an intersection point. What is it about midlife that seems to give people permission to transform their everyday lives and rewrite their destinies? Is it that newfound freedom, that sense that all their duties have been fulfilled? Many have arrived at a comfort level in their careers, and suddenly life stretches ahead, an empty canvas waiting to be written on. It is surely an exciting age and time for the quarter million Indians aged 45-55 to be sitting on the cusp of midlife. Once 50 prepared you for retirement; in India 55 is still retirement age. Now 50 seems to be the new 40 as medical advances, health consciousness and active lifestyles make retirement and the rocking chair seem quite distant. Hobbies suddenly become vocations and lifelong passions in this second act. Of course, not every immigrant can take off on flights of fancy. For the vast majority, life is just more of the same as they remain embedded in their careers and the necessity of earning a living. They do not have the luxury of transforming their lives dramatically; work still pays the bills. But for those who have “made it,” or arrived at some semblance of financial security, there is the chance to experiment with new lifestyles. Not only are they in mid-life, they are also midway between lives in two countries – India and America. If they have fond memories of childhood and youth in their hometown, they now have equally golden memories of marriage and parenthood in America. If India saw the birth of dreams and education, America is where they were realized – or dashed. Life for immigrants is a hodgepodge of thoughts and memories: you can walk on the New Jersey waterfront and recall the River Yamuna, viewed from a hurtling train headed from Delhi to Jaipur. Or you can stand on the banks of the Hudson and flash to the curve of the Queens Necklace seen from Bombay’s Marine Drive. New York morphs into Bombay and back again. Life becomes a montage of homes and encounters on two continents. So where is home? Where do their loves and loyalties really lie? Is the call of India fading or is it just as evocative as ever? What place does America have in their affections? Do they see themselves as Indian or American or a bit of both? Midlife is also time for introspection and some begin to evaluate whether they are really content with their life or want a change. There’s also the feeling of “been there, done that,” boredom with the 9 to 5 routine and a desire to venture on the roads less traveled, especially if one is not financially bound to the workplace. It is sometimes an opportunity to re-invent oneself. In 2002, at the age of 45, Vivek Wadhwa, chief executive officer of Relativity Technologies in Raleigh, N.C., gave up his spiffy corporate office and decided to invest in a fun Hollywood-Bollywood movie. And then he changed careers yet again to become a professor at Duke University. As the pains became more severe, Wadhwa checked into the hospital to learn that he was in the middle of a massive heart attack. He says, “It was like the Twilight Zone.” Things got worse, as the investors tried to take over the company and an ugly corporate battle ensued. Wadhwa recognized he had come to a fork in the road. Wadhwa exited from the tech world not knowing what he would do next. Meanwhile, his high profile tech life had taken a toll on his family life. His son Vineet wanted to join Bollywood and become a movie star. Wadhwa too was cured of his own Bollywood fascination after this one time fling, which lasted about a year. He decided that being a CEO meant too much pressure, long hours and being part of the tech rat race. So he took up a whole new role as an executive in residence in the Engineering Management program at Duke University in Durham, N.C. He is also a regular columnist for BusinessWeek Online and is relishing this new phase of his life. 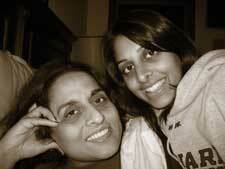 Anju Bhargava with her daughter. For Sital Jain, life was one big construction site, from India to America. After working for three years in construction companies in UK, he immigrated to the United States in 1970. “I worked for a real estate development company in Manhattan for seven years and we bought buildings and renovated them and managed them ourselves,” he recalls. He later moved to another company in Westchester, rising to vice president and becoming partner. The business was sold in 2003 and the partners decided to pursue their own interests. With no money constraints or business to worry about, Jain decided to pursue his two childhood passions – show business and adventure travel. 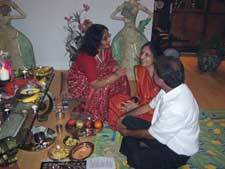 Anju Bhargava is a Hindu pujari or priest, actually performing pujas, probably the first woman in New Jersey to do so. To satisfy the show business urge, Jain has invested money in Hiding Divya, a feature film made by young Indian American filmmakers in New York and starring Madhur Jaffrey. He’s been on the location shooting a few times and plans to be involved with more films. But then are those who carry India to America with them. The seeds of Anju Bhargava’s interest in community building were sown when she lived in India. Her father was with an oil company and the family lived in many parts of India, from Lucknow to Calcutta to Madras. She learnt first hand about diversity, living in many different cities. 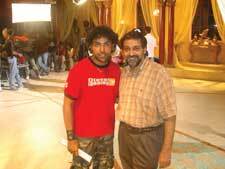 Vivek Wadhwa with his son Vineet on the set of Bollywood Bride. By the time her daughter went to college, Bhargava’s began devoting much more time to community activities. “It’s a continuum. I’ve been doing cultural activities from festivals to classical literature so one day it all converged – the big change is I see it all coming together and simplifying and synthesizing it,” says Bhargava. What were earlier just interests and hobbies are now coming center stage. Her interest in Hinduism escalated after she became the Hindu representative at Interfaith Clergy Association in New Jersey. Her interest in Hinduism had been developing over the years as she tried to give her daughter the best of both cultures: “I grew as my daughter grew. I would say actually for me doing pujas took 25 years of preparation. Most people go from ritual to philosophy. I have gone from philosophy to ritual. Puja has brought the philosophy to life for me.” And yes, as a pujari, she gets a ‘Dakshana’ or offering, which she donates to charitable causes like cataract surgeries in India. While Bhargava has brought Vedic rituals to her New Jersey neighborhood, Dr. Tulasi Polavarapu has taken her medical expertise back to her hometown in Andhra Pradesh. An obstetrician and gynecologist, Polavarapu came to Milwaukee in 1972 with her husband, an orthopedist. The early years were spent in residency training. The couple moved to New York where they both established their private practices in 1978. By the 80’s they were well settled and became involved in social work with local organizations. Both their children went on to become physicians. 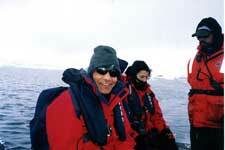 “The adventure travel keeps me fit. There are millions of places I’d like to go.” Sital Jain. Along with several other New York physicians, the Polavarapus started the Indo-American Cancer Organization and funded a cancer hospital, the Indo-American Institute and Research Center in Hyderabad. The land was donated by the state of Andhra Pradesh and physicians from New York donated $2 million for the equipment. The organization has also funded a mobile van with state of the art equipment for cancer detection, which goes to villages in remote parts of Andhra Pradesh. The Polavarapus travel to India four times a year to serve for 6-7 weeks at a time. She adds, “I feel a humbleness and a gratitude for America. But still, since I was born and raised there, and my moral and ethical values are there, I feel still I belong to India.” In fact, both her children, though born here and schooled here, went to India for their medical studies. For them, the Indian connections are strong too. The Polavarapus have taken their medical expertise back to her hometown in Andhra Pradesh. Many women in their late 40’s and 50’s are almost getting a second wind. There is almost a role reversal: men who have spent their lives traditionally in the work force, are slowing down, taking pleasure in concentrating on golfing or even cooking, which for many is new, relaxing – even exotic. They are all set to loosen their neckties. Women, who often had to juggle outside work with their roles as caregivers and housekeepers, are finding themselves freed from childcare and able to concentrate on their professions ever more seriously. For many, it’s a time to make up for the missed opportunities while on the mommy track, a chance to see how far they can really go. Ramaa Bharadvaj of Los Angeles, Calif., who came to the United States in 1978 from Chennai, is director of Angahara Dance Ensemble and is a choreographer,writer, dance activist and on the dance faculty at Orange Coast College and Pomona College. 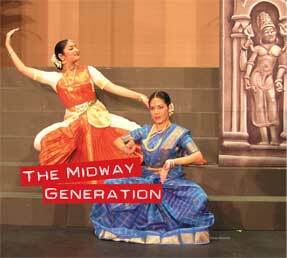 When the arts council was put on the butcher block, Bharadvaj initiated a movement to keep the arts council alive, holding rallies and writing about it extensively. So in midlife instead of slowing down, she became much more active. America opens up closets where music, golf, academics or even female pujaris become exciting possibilities. For most Indians, the U.S. Senate’s recent approval of the nuclear co-operation deal between India and America was merely welcome news. But for Swadesh Chatterjee it is all very personal, as he has been working hard to see it become a reality. The engineer who came to America as an immigrant with just $35 is now a strong political advocate for Indian American relations. Chatterjee worked as an engineer for nine years in Calcutta before coming to North Carolina to work for Brandt Instruments as head of engineering. 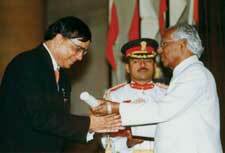 He ended up buying the company in 1984 and sold it in 1992, staying on as CEO till 2000. Chatterjee then turned his attention to his real passion, which is community work, working with TiE and building relationships. 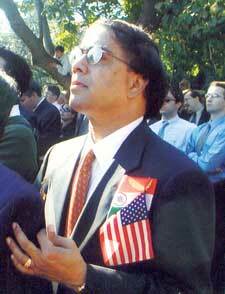 In 1998, he was elected national president of Indian American Association for Political Education (IAFPE), the year India had its nuclear test and Indo-US relationship was at an all-time low. Chatterjee took the challenge to improve the relationship, to help lift the sanctions against India and convince policy makers. He worked closely with Senate Foreign Relations Committee Chairman Jesse Helmes and was amongst the group accompanying President Clinton to India in 2000. Does he see himself as an Indian or an American, and was it hard giving up his Indian passport? “I always say I’m the child of two mothers – Mother India, whom I can never forget,” says Chatterjee. “I’m out of India, but India is never out of me. So the passport is just a symbol. But inside me I’m so Indian that my passport cannot describe me. I’m Indian inside out. He sees himself dividing time between his two countries and remains hopeful about the nuclear co-operation deal, because he feels it’s not just about nuclear energy, but a strategic relationship between the United States and India for the next 50 years. They can really move easily between India and America as their two homes?